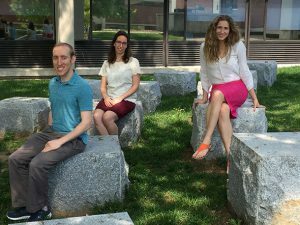 It’s time to bid a fond farewell to three research specialists, Ariel Stein, Sarah Meyer, and Viktoria Bedo, who are moving on to new adventures. Before they depart, we want to tell you a little more about them and what they have been up to. Ariel Stein grew up in the Orthodox community of Baltimore, MD. He studied psychology and Jewish studies at the University of Pennsylvania. A former research specialist and college classmate of Ariel’s, Dina Bleckman, mentioned her work at CMJS and suggested he apply. While at CMJS, Ariel worked on a number of projects, in particular those focusing on program evaluation, Israel education, and young adults. Ariel notes he has gained professional skills in a number of areas: study and survey design, analysis, and interviewing. In addition to his work here, Ariel is also the co-creator and editor-in-chief of the Jewish Literary Journal. Ariel is moving with his fiancée to Los Angeles.